As Holy Scripture tells us: In those days came John the Baptist, preaching in the wilderness of Judea, “Repent, for the kingdom of heaven is at hand.” For this is he who was spoken of by the prophet Isaiah when he said, “The voice of one crying in the wilderness: Prepare the way of the Lord, make His paths straight.” Now John wore a garment of camel's hair, and a leather girdle around his waist; and his food was locusts and wild honey. Then went out to him Jerusalem and all Judea and all the region about the Jordan, and they were baptized by him in the river Jordan, confessing their sins.... [And John said,] “I baptize you with water for repentance, but He Who is coming after me is mightier than I, Whose sandals I am not worthy to carry; He will baptize you with the Holy Spirit and with fire” [Matt. 3:1-6, 11). The next day he saw Jesus coming toward him, and said, “Behold, the Lamb of God, Who takes away the sin of the world! This is He of Whom I said, 'After me comes a man Who ranks before me, for He was before me'“ [John 1:28-30]. Then Jesus came...to John, to be baptized by him. John would have prevented Him, saying, “I need to be baptized by You, and do You come to me?” But Jesus answered him, “Let it be so now; for thus it is fitting for us to fulfill all righteousness.” Then he consented. And when Jesus was baptized, He went up immediately from the water, and behold, the heavens were opened and He was the Spirit of God descending like a dove, and alighting on Him; and lo, a voice from heaven, saying, “This is My beloved Son, with Whom I am well pleased” [Matt. 3:13-17]. And John bore witness, “I saw the Spirit descend as a dove from heaven, and it remained on Him. I myself did not know Him; but He Who sent me to baptize with water said to me, ‘He on Whom you see the Spirit descend and remain, this is He Who baptizes with the Holy Spirit’. And I have seen and have borne witness that this is the Son of God” [John 1:32-34]. 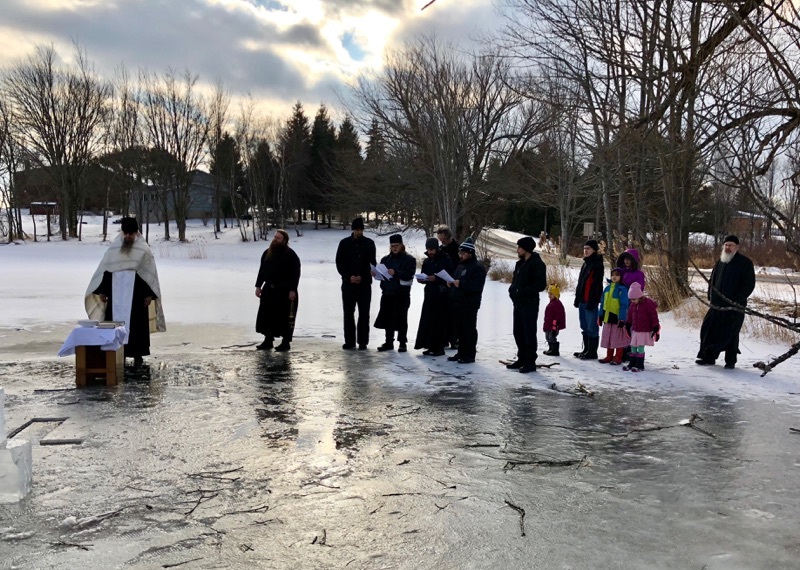 The Feast of the Epiphany reminds us of our own Baptism in the hymn sung just before the reading of the Epistle at the Divine Liturgy: “As many as have been baptized into Christ have put on Christ. Alleluia!” For in the waters of Baptism, we put off the Old Man and put on the New, that is Jesus Christ, and strive to acquire the humility shown by the Lord Himself when He, the Creator, bowed His head under the hand of John, the creature, in the waters of the Jordan River.